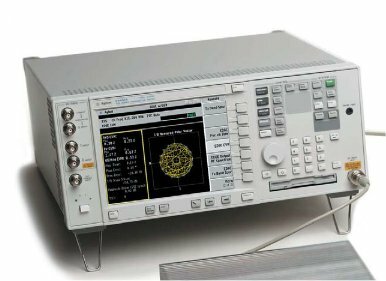 The Agilent E4406A is a flexible vector signal analyzer designed for wireless testing applications. This quality analyzer is optimized for testing a wide range of standard formats. It blends accuracy and speed in one easy to use tester, making it an ideal option for today’s challenging needs. The E4406A is designed to allow engineers to test conformance to different formats using one-button measurements. Wireless systems are dynamic and they keep on evolving. To address this, the E4406A has a modular design that makes it upgradable. It is an excellent solution when working with various wireless systems’ applications including HSDPA/HSUPA, W-CDMA, and EDGE/GSM. Learn more about High-Speed Downlink Packet Access Here. Operators can easily customize and enhance the functionality of the unit by adjusting its frequency and formats. In addition, the E4406A can capably assist to speed up production times and enable users to carry out various test measurements. Some of the popular formats that it easily adapts to include cdma2000, HSDPA/HSUPA, W-CDMA, 1xEV-DO, 1xEV-DV, cdmaOne, NADC, EDGE, GSM, Spectrum, WiDEN/iDEN, and Waveform.It also offers enhanced throughput. Learn more about Wideband Integrated Digital Enhanced Network (WiDEN) Here. Progressive enhancements have helped to improve various features of this vector signal analyzer to ensure that it is capable of addressing the growing testing challenges. For instance, the current analyzer is far much faster than the initial design. Virtually all its measurement features have improved in speed making it a suitable choice for various applications. Built-in algorithms and record time data are used to calibrate the transmitter power of the E4406A. This smart design technology enhances the rate at which the results are obtained. With just a few keystrokes, operators are able to obtain results quickly and easily. Technicians find this very useful in numerous applications in both research and development. The one-button measurement feature and the logical user interface offered by the E4406A allows users to attempt multiple tests quickly and easily. The pre-configured one-button measurements find many applications in cellular systems as well as in narrowband spectrum measurements. Unlike conventional signal analyzers, the E4406A allows operators to carry out amplitude and inter-modulation distortion measurements nearly three times faster. In addition, the enhanced speed of carrying out measurements does not compromise accuracy. The E4406A combines high accuracy and linearity to offer users highly reliable results. The E4406A signal analyzer also features a high-resolution color display that enhances the user interface. This large display enables operators to view multiple traces clearly. Its zoom feature allows users to display measurement windows of their choice. Furthermore, the E4406A offers an automatic alignment feature that enhances the accuracy of the measurements. This built-in feature provides PC compatibility. The parallel, GPIB, and High-speed 10baseT LAN ports are suitable for fast communication between the signal analyzer and additional test equipment peripherals. With accuracy and speed being so important in today’s testing environment, the Agilent E4406A is a solid, cost effective choice. Its W-CDMA (ACPR) test and measure times have improved almost eightfold over previous models, and GSM output (ORFS) measurement time is nearly 5 times faster than its predecessors. This ultimately improves productivity and lowers costs for end users. For a quote please contact Test Equipment Connection. This entry was posted in Site News and tagged Agilent E4406A. Bookmark the permalink.